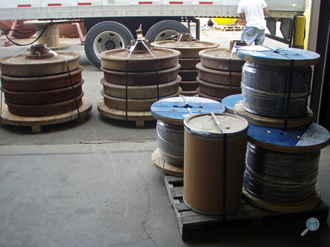 Mooring Systems manufactures and supplies a large array of mooring components, hardware, and special rigging devices. 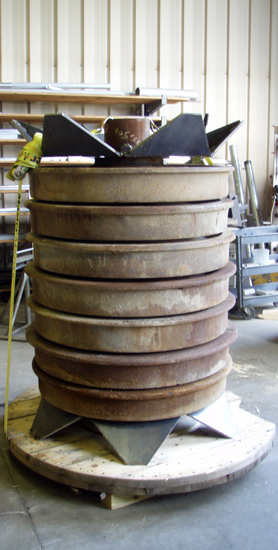 for S-tether "top of mooring"
We have a large press for making wire rope swage fitting terminations and a hydraulic load testing device for testing. 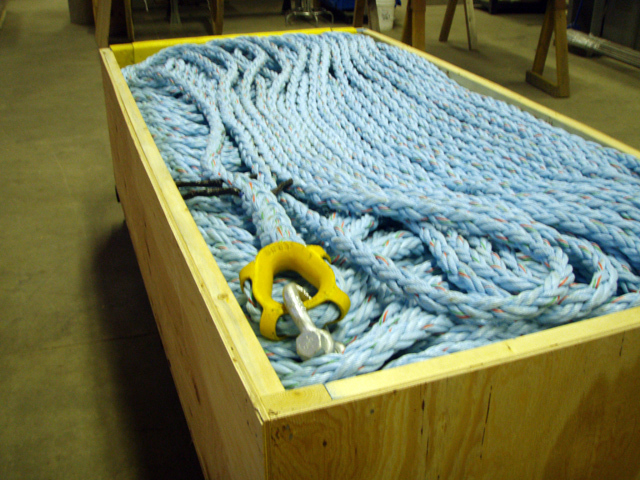 We routinely splice 8-strand plaited ropes and 12-strand spectra ropes for the multitude of mooring and pop-up buoy applications. We perform complete pre-assembly of a surface buoy S-tether mooring. 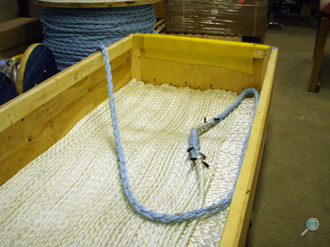 Above: Nylon to polypropylene splice for S-tether "middle"
Above: Polypropylene splice for S-tether "bottom of mooring"
This application allowed deployment of the mooring directly into the water from the box secured on the ship deck. We manufacture upper sediment trap rope bridles with no metal components, or stronger wire rope bridles, and heavy lower chain bridles for trap stability during deployment and recovery. 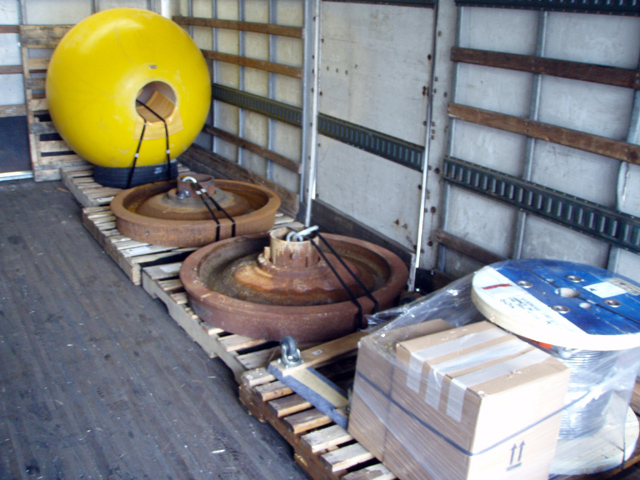 Mooring Systems provides kits for placing two acoustic releases in Tandem for added reliability. 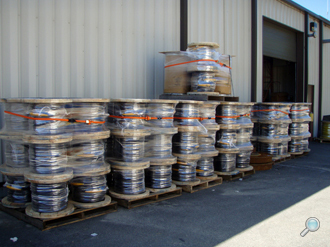 Our kits included release chains with welded drop-links to stream line assemblies for easy slipping through anchor chain weld-less rings. 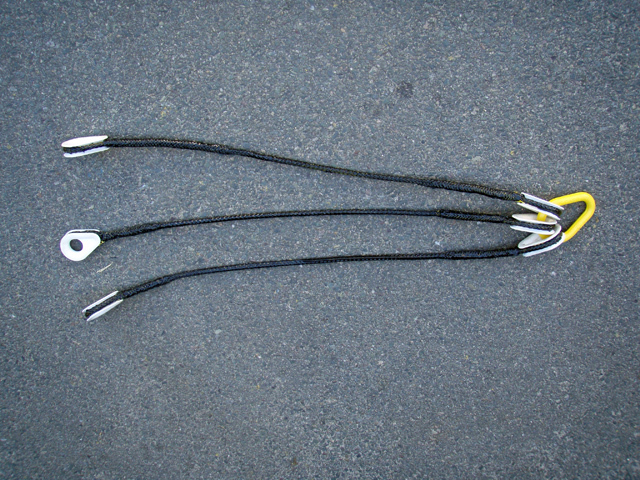 Our kits include upper bridles, mounting bolts or brackets as needed for the model of release, rings, and upper chain bridles. 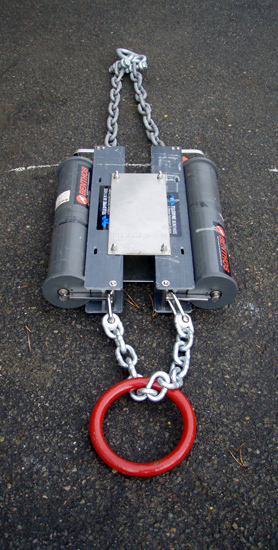 Mooring Systems sources only quality chain and hardware for proven reliability for long term use in seawater. 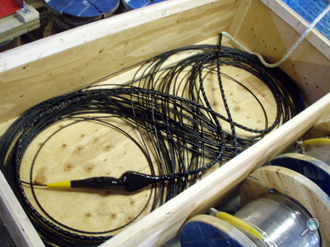 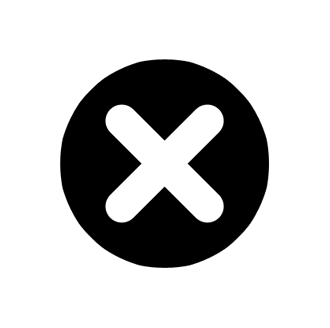 We stock the standard sizes for use in most oceanographic instrument mooring applications. 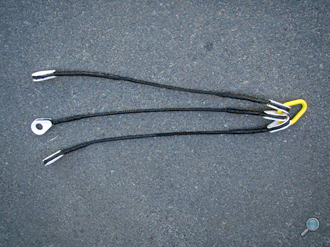 Our Anchors are assembled using 900 lb. 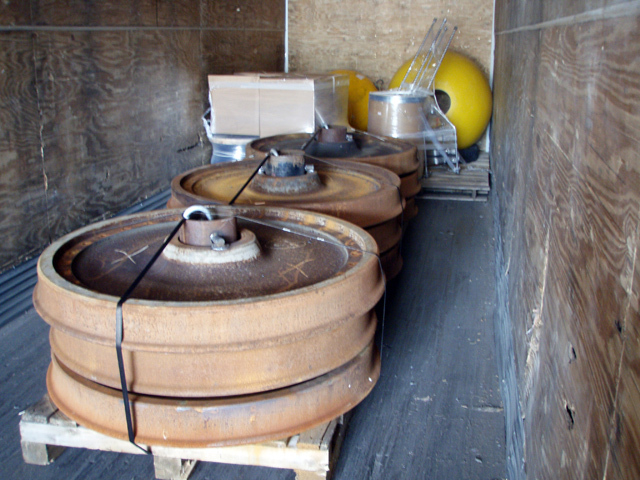 locomotive train wheels. Assemblies can be customized for any number of wheels to obtain the desired ballast weight. 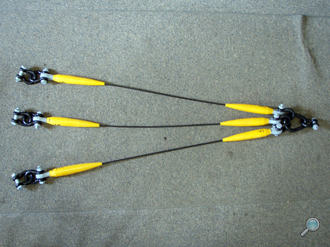 Center posts are provided with a pinned pear link for connecting to the mooring chain. 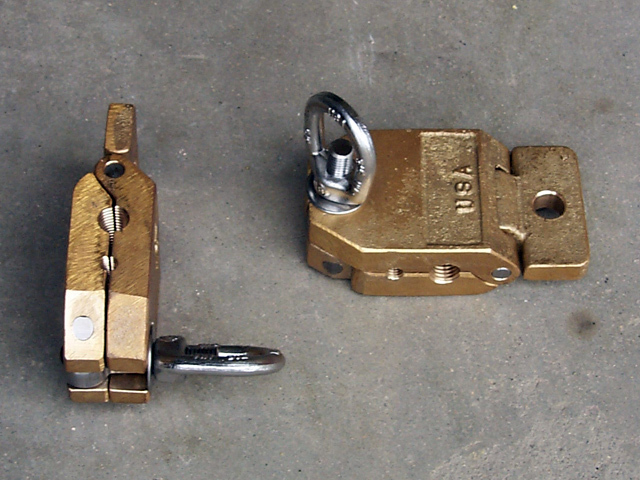 Mooring Systems supplies bronze wire rope clamps for CTD and other instrument casts. 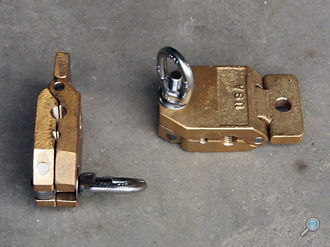 These clamps can be factory set for the wire diameter used on a specific vessels winch. 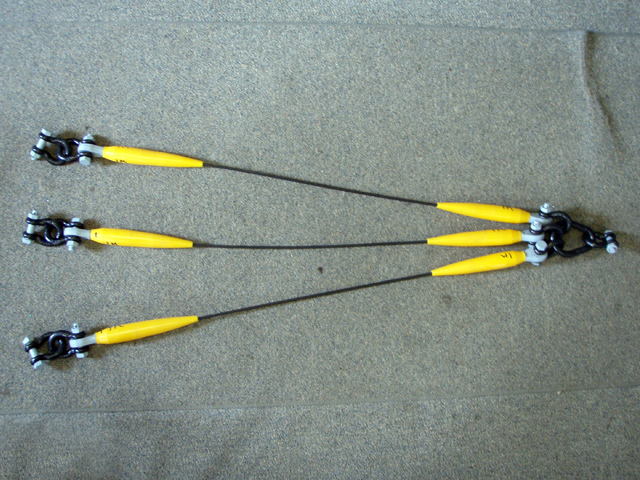 Above Left: Nylon to polypropylene splice for S-tether "middle"
Above Right: Polypropylene splice for S-tether "bottom of mooring"